Q. How do I setup Sync? Q. How do I sync between Mac and iOS? 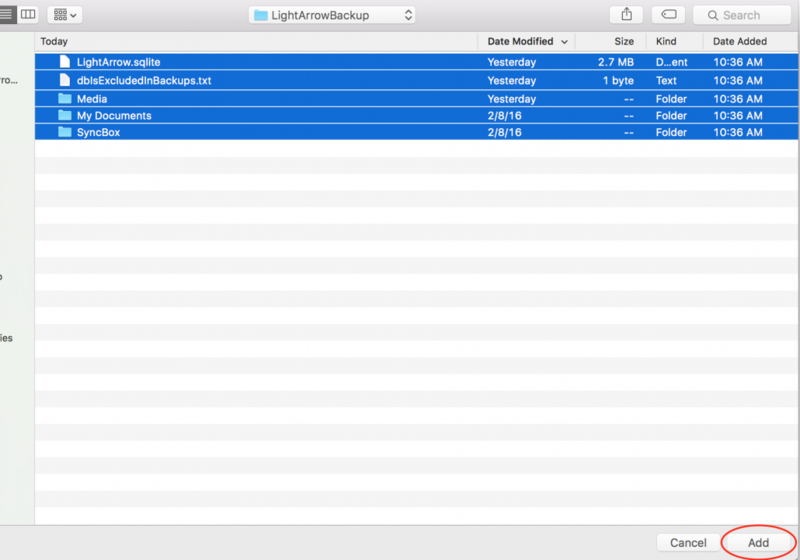 When you perform an Email Backup operation, all of your core LightArrow data at that point in time is saved in a file and sent to an email address which you specify. “Core data” is defined as all data except audio clips, photos, videos, and local documents. Before you can backup your data via email, you must specify an email address as described below. Then, simply tap Email Backup to initiate a backup operation. A pop-up dialog appears indicating that a new backup file will be created and emailed. In the Backup, Restore & Sync view, tap Backup email address. Type the email address you wish to send the backup to. You are now ready to perform an Email Backup by tapping Email Backup. 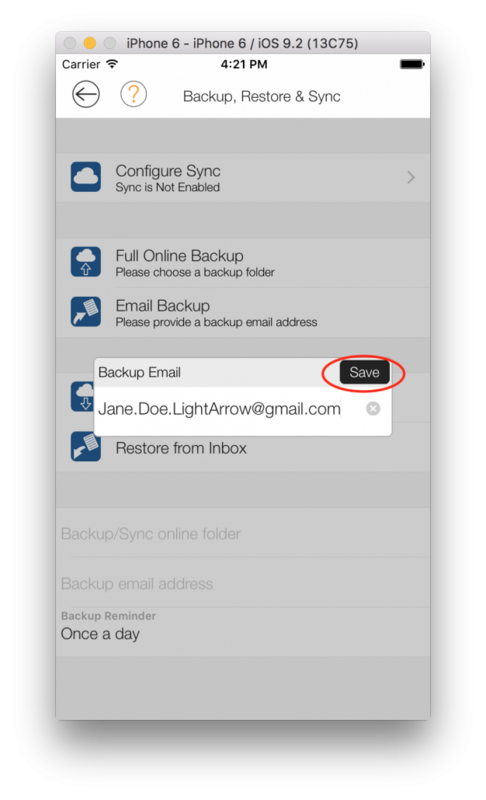 Ensure you set up a backup email address in the Backup, Restore & Sync view. 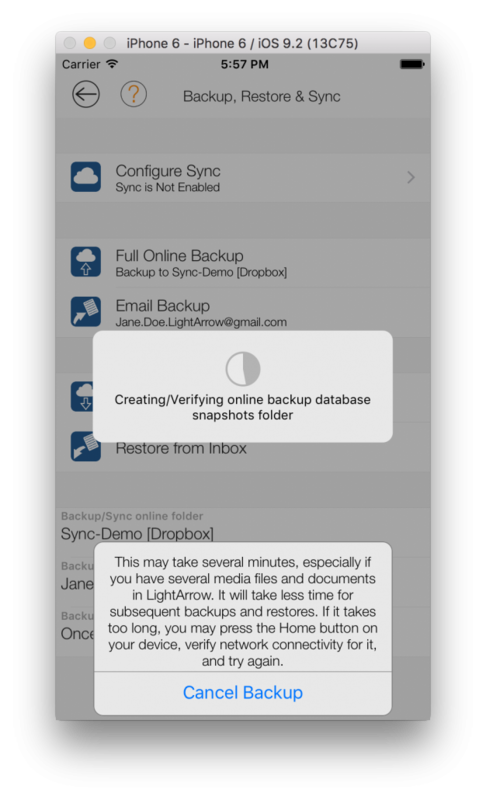 Simply tap Email Backup to initiate a backup operation. A pop-up dialog appears indicating that a new backup file will be created and emailed. Cancel the operation, or tap OK to proceed. Tap Send to send the backup to the email as directed. If your device has no network access when you perform an Email Backup operation, the outgoing message is placed in your Outbox. When access to a network is restored, this email is sent automatically. 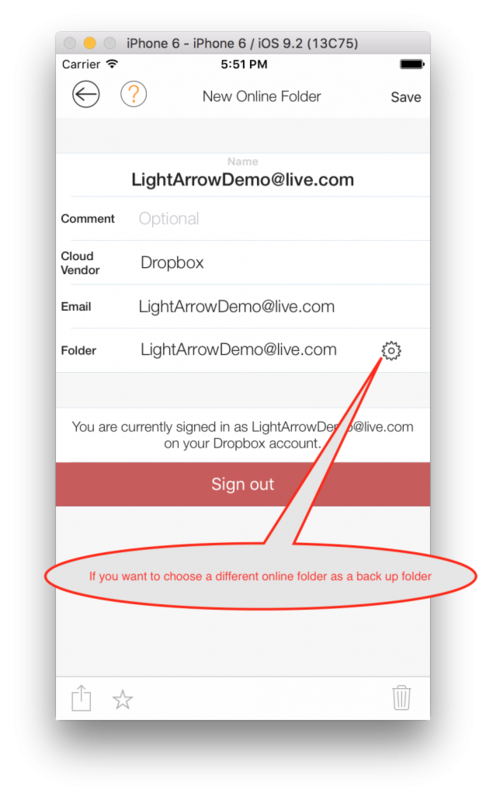 The Backup/Sync online folder field contains the cloud location to which your LightArrow app backup is sent when you perform an Online Backup operation. This location is a directory to an online file service such as Dropbox or Box. If no value is set, you cannot perform an Online Backup. Note that the backup file is not encrypted, so consider security when choosing the target cloud location for the backup. 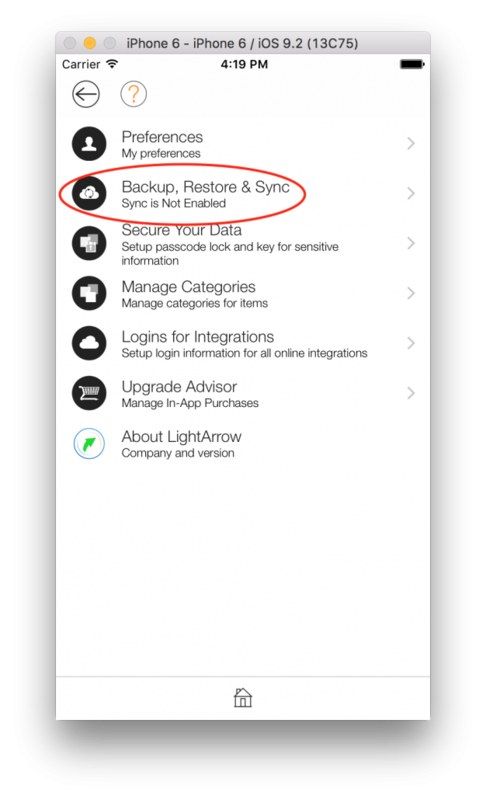 In the Backup, Restore, and Sync view, tap Backup/Sync online folder. If you previously set up online folders, they will be available from your selection. If you wish to set up new folders, tap New. In the New Online Folder view, tap File Service and choose the Cloud Vendor (Dropbox, Google Drive, etc.) you wish to use. We recommend the Dropbox option. In the Email field, type your Email that you use for sync and then tap Sign in. 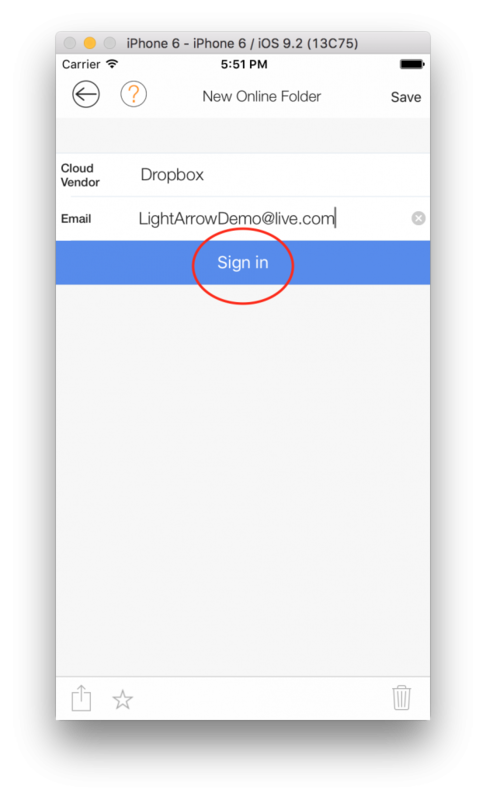 Sign into the cloud service that you plan to use and authorize usage of the app. 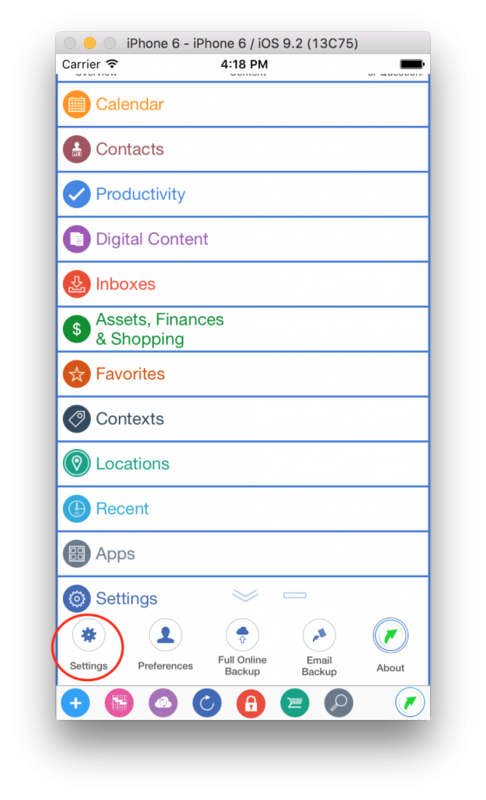 When the New Online Folder view appears, optionally set a name of the folder by tapping Tap to set name. If you don’t name it, the app will name it for you. If you selected a subfolder, tap Select to select it. When the New Online Folder view appears, tap Save. When you perform an Online Backup operation, all of your data at that point in time is saved to an online folder that you specify. Before you can backup your data via online services, you must specify an online folder as described previously. Note: This operation is only available when you have WiFi access. Ensure you set up an online email address in the Backup, Restore & Sync view. 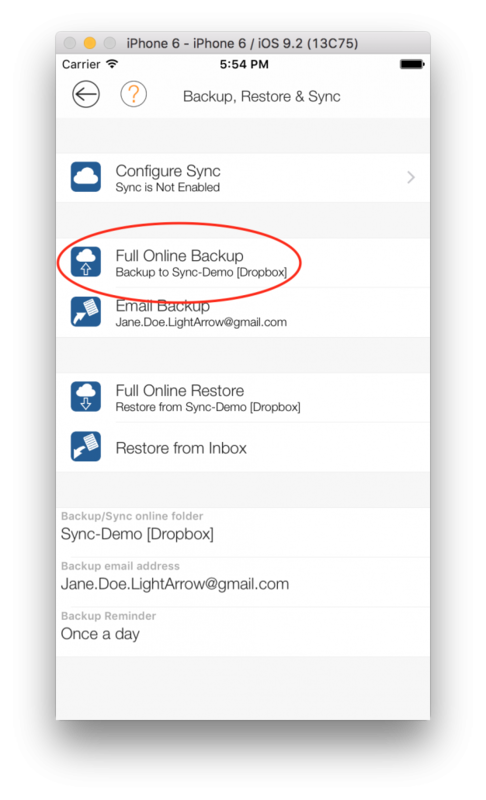 Simply tap Online Backup to initiate a backup operation. A pop-up dialog appears indicating that the operation will begin. Cancel the operation, or tap OK to proceed. For more information on creating an online folder, see: How do I use Online Files and Folders? You can perform backup of your LightArrow iOS app using iTunes to store it locally on your Mac or PC. Note that you can use CMD-Click (on the Mac) to select multiple files/folders in the above screen. Click on “Save to…” as shown above to save these folders to a local Mac/PC backup folder. This will make a backup of the existing data for LightArrow app on your PC or Mac. Note: Restoring backups that were performed prior to an update of the application may not work. 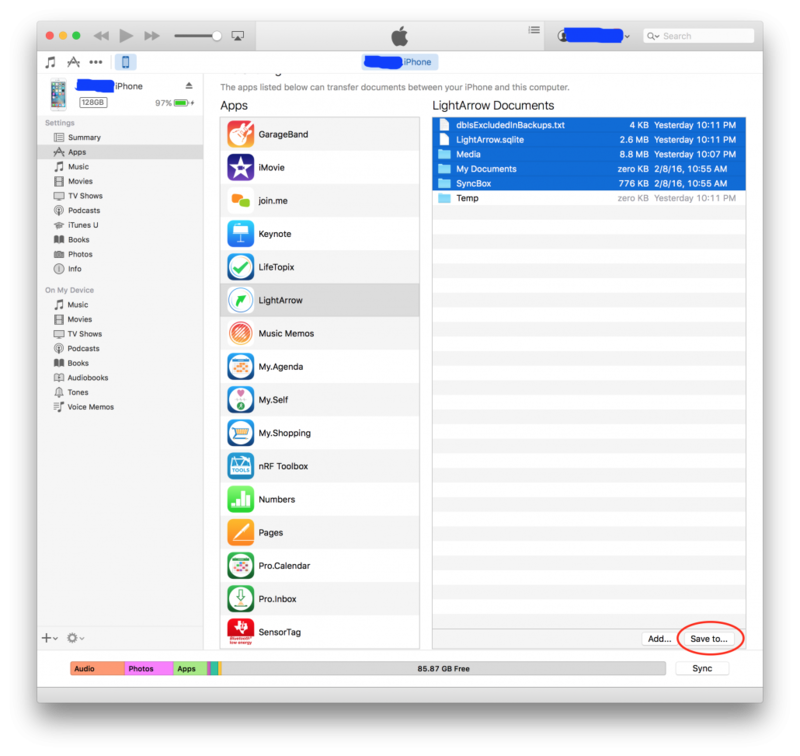 Therefore, any time you update your app from the App Store, you are strongly encouraged to perform a sync in iTunes and an Online Backup immediately. On your device, open the Mail application and access the account to which the backup was emailed. In the Mail application, open the email message containing the backup that you wish to restore. 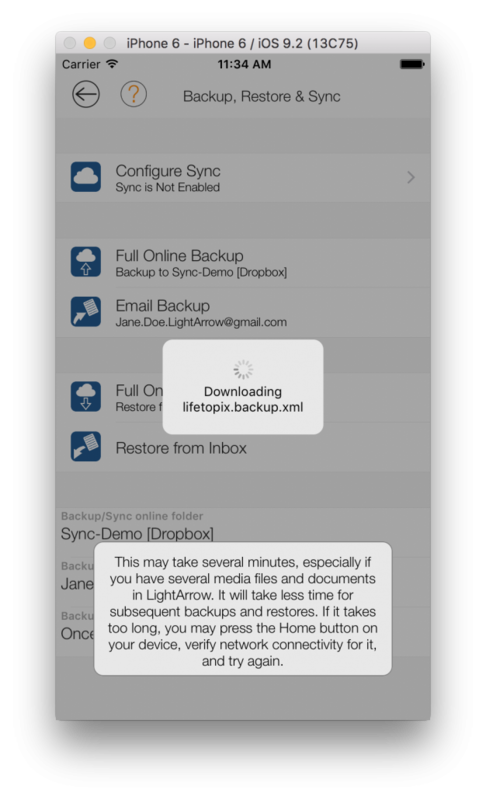 Note: By default, only one attachment is contained in an email, and it is named lifetopix.backup.xml. If you made modifications to the email message when you performed the backup operation, consider how those changes might affect these instructions. Tap-and-hold the attachment in the email message. The mail application will ask you if you want to Quick Look, Open in ‘Your App,’ or Cancel. Select Open in ‘Your App,’ which will invoke your app. At this point, your device has placed the backup file in a private location. Tap OK to perform the restore operation. After a short delay, the message box will go away, indicating that the restore has completed successfully. When you perform a Full Online Restore operation, all of your device’s app’s data — including your audio clips, photos, videos, and local documents — are replaced with the app’s data from the online folder that you specify. Before you can restore from the cloud, you must first ensure that you’ve set an online folder that contains the backup you wish to restore, as described above. Sync must be turned off before you perform a full online restore. The Backup, Restore & Sync view, tap Full Online Restore to initiate a restore operation from the cloud. All data will be removed and replaced with the data from the cloud, and that it may take several minutes depending on network speed. Cancel the operation, or tap OK to proceed. Note: This operation is only available when you have WiFi access. When you prefer not to use online backup, iTunes backup & restore is a nice alternative to store the backup data and files on your PC or Mac. This will restore all your data, media and documents as well. Connect your iOS device to your Mac or PC and open the iTunes app. Navigate to the below screen and click on “Add…” button. 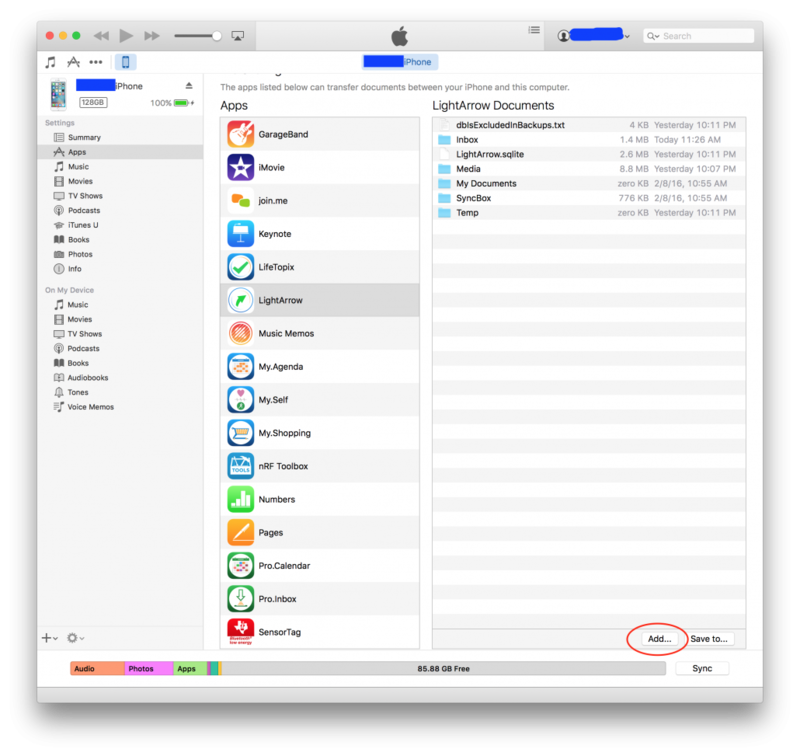 Navigate to the folder where you’ve stored the backup files when you did a last iTunes backup. 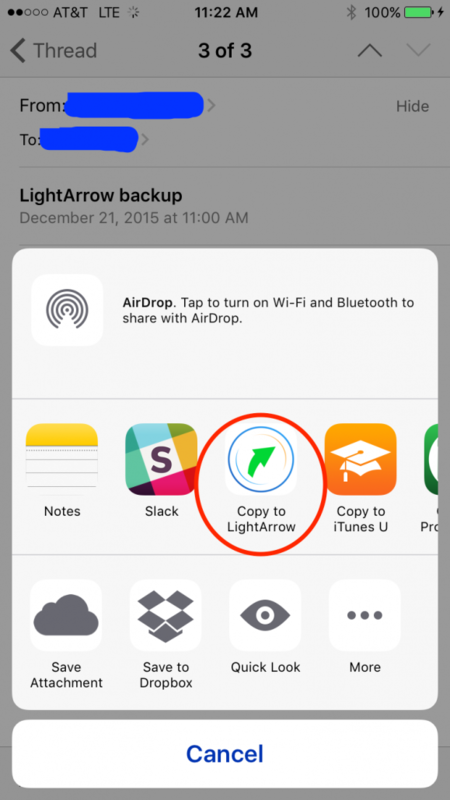 This will restore your LightArrow iOS app data from the backup you’ve stored locally on your PC or Mac. Your LightArrow app will remind you to back up your data on a regular basis. You can change how often you’re reminded; the default is once a day. 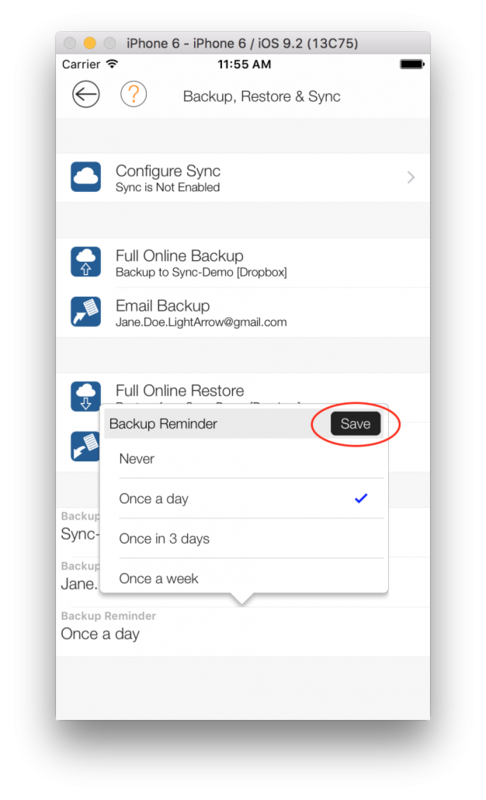 In the Backup, Restore & Sync view, tap Backup Reminder. Select Never, Once a day, Once in 3 days, or Once a week and tap Save. You can use the above backup and restore features to accomplish a one-way copy of your data from one device to another via the cloud or iTunes. This procedure also works for transferring data from My.Agenda to LifeTopix and vice versa. 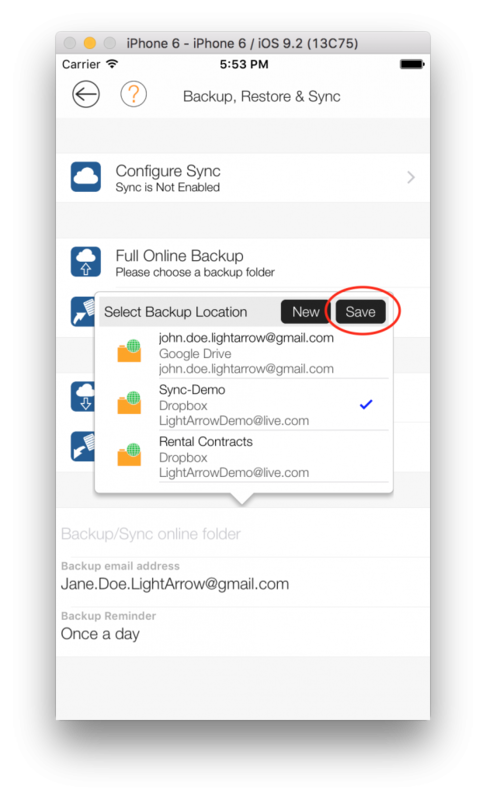 In the Backup, Restore & Sync view, perform an (online, email or iTunes) backup to an online or local folder from your source device. Perform a restore from (online, email or iTunes) backup that online folder on the new device. The data is replaced with the data from the original device.